The brachialis is the underappreciated workhorse of elbow flexion. When one is asked to show their muscle, usually the biceps brachii takes the spotlight. Both the brachialis and biceps flex the elbow, so why isn’t the brachialis muscle as popular? The answer is because much of the brachialis is hidden underneath the biceps and cannot be seen. The brachialis is surprisingly strong and doesn’t get the credit it deserves. Many times, it doesn’t get the care it deserves either. 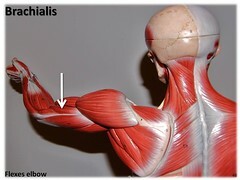 The main function of the brachialis muscle is to flex the elbow. It works with the biceps brachii, brachioradialis and supinator. Certain positions engage the brachialis more or less during elbow flexion yet there is variability in contraction of the muscle in each position. Therefore, assessment of brachialis pain requires some skill and good technique. Pain and spasm in the brachialis muscle can come about from activity such as lifting heavy objects or holding the arm in flexion for long periods of time. Playing instruments such as a saxophone or guitar can trigger brachialis pain over time. Other activities, such as typing on a computer while arms are unsupported, or carrying groceries can elicit a tight brachialis. An injured or tight brachialis commonly causes pain in one or more of four locations. Local pain may be felt on the outer portion of the humerus where the brachialis can be palpated. Pain may also be felt near the muscular point of attachment on the proximal part of the ulna. Referred pain may be felt at the base of the thumb on the same side as the affected brachialis. The ipsilateral anterior shoulder or deltoid may also show tenderness from referred brachialis pain. A muscle spasm or just plain tightness in the brachialis can impinge the radial nerve. Symptoms of this nerve irritation affect the thumb and give the person a feeling of tingling or numbness in the thumb. Since only the sensory portion of the nerve is affected, loss of strength in the thumb is not seen. Much of the treatment for the brachialis can be done at home using the thumb of the opposite hand. A massage tool could also be helpful for stubborn trigger points or muscle spasm. Your alternative health practitioner can also be of great help, especially if one is searching for a natural healing therapy. At August Point Wellness, we believe that many of the brachialis muscle issues can be addressed through acupuncture, massage therapy, and self-care. Does the brachialis have a secondary function such as being a synergist, neutraliser etc? Good question. The brachialis only functions as an elbow flexor. It is a synergist muscle of elbow flexion and works in conjunction with three other muscles: biceps brachii, brachioradialis, and pronator teres. The contraction of all four muscles occur synergistically to flex the elbow with wrist position being a large factor in controlling which muscle(s) take up the brunt of the work. The interesting thing is that repetitive flexing of the elbow from a single wrist position will engage this group of muscles differently, which causes varying degrees of contraction from each muscle. The result is a somewhat random firing of muscle fibers with each flex of the elbow. I hope that helps!